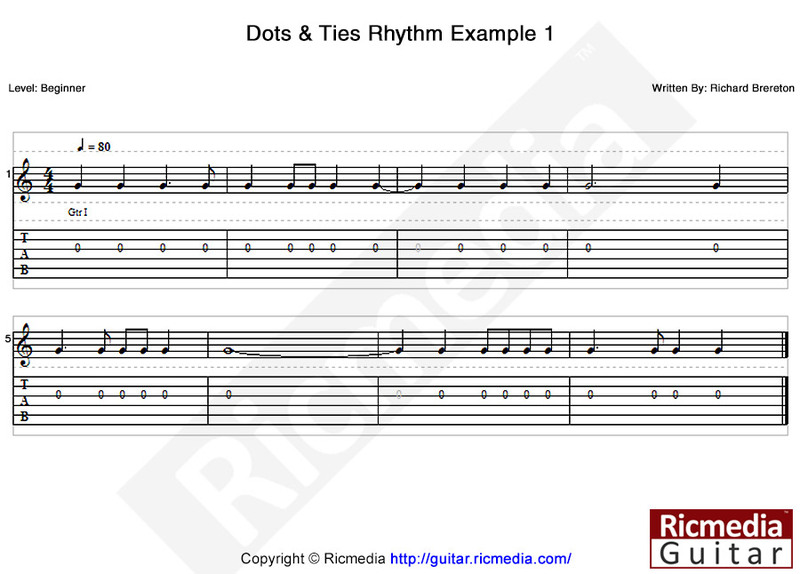 So far, we have studied note, rest and rhythm notation values and the symbols that represent them but today, we will be learning all about dots & ties which are additional symbols that alter the value of a note, rest or rhythm slash. A dot directly in front of a note, rest or rhythm slash has the effect of adding half of that symbols value to itself, for example: a dotted quarter note has the value of one quarter note plus one eighth note (an eighth note being half the value of one quarter note). As another example, a dotted half note has the value of one half note plus one quarter note (a quarter note being half the value of the half note). There are also double dotted notes, rests and rhythm slashes (not used too often) that add half and a quarter value to any given symbol. An example of this would be a double dotted quarter note, which has the value of one quarter note, plus one eighth note, plus one sixteenth note (an eighth note being half the value of the quarter note, and a sixteenth note being quarter the value). Below you will find a chart with further examples so take some time to look at it closely. An important rule you must keep in mind about dots is that you should never see, or should never write, a dotted note whose value exceeds the measure, in other words the additional value should never go over the bar line. If your composition requires you to go over the bar line, that is when we use a tie, which is the next part of this lesson. A tie is used mostly when the value of a note, rest or rhythm slash causes it to go over the bar line and exceed the measures value, or in place of a dotted note that is having the same issue. As an example: say we are in 4/4 timing and we have a measure that has three quarter notes, and one dotted quarter note, this would cause the dotted note to exceed the measure by an eighth note (half the value of the quarter note). In this instance we would replace the dotted quarter note with a normal quarter note, and tie it to an eighth note in the next measure, or "over the bar line". Ties can be used for other situations that would otherwise cause rhythmic issues and we will discuss them in future lessons. The chart below shows different notes, rests and rhythm slashes tied to one another, so take a close look and perhaps try writing your own. 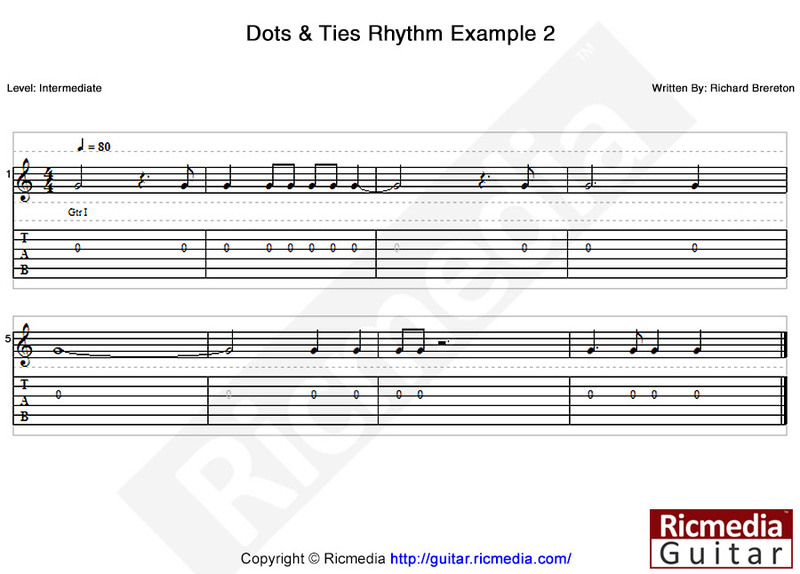 In these two examples I have written some common situations where you will likely come across dots and ties in compositions. If you are a beginner, then first listen to the audio sample for each rhythm chart and try to follow it looking at the charts. For intermediate and advanced players you should try and master both charts after listening to the audio samples. Now you are armed with more knowledge that will definitely come in use, if your still stuck, try going through the lesson again or take a look at other resources below. Thank you! Yhat helped a lot.